Director – Corin Hardy, Screenplay – Gary Dauberman, Story – Gary Dauberman & James Wan, Producers – Peter Safran & James Wan, Photography – Maxime Alexandre, Music – Abel Korzeniowski, Visual Effects Supervisor – Bruce Jones, Visual Effects – Ghost VFX, Hollywood Visual Effects & Shade VFX, Special Effects Supervisor – Adrian Popescu, Makeup Effects – Alec Gillis & Tom Woodruff, Jr., Production Design – Jennifer Spence. Production Company – Atomic Monster/Safran Company. In 1952, Father Burke, a miracle investigator for The Vatican, is assigned to travel to the abbey of St Cartha in the rural town of Biertan in Romania after a local man finds a nun’s body hanged. Burke is asked to take with him Sister Irene who is just about to take her vows as a novitiate nun in London, although she is puzzled over what possible connection she has. They investigate the abbey and find how it was built in the Middle Ages by an aristocrat who was obsessed with the occult before being appropriated by the church. They discover that the abbey is haunted by a demonic force that inhabits the body of a nun. As they seek to exorcise the nun, it marshals all supernatural force against them. The Nun is a spinoff from James Wan’s The Conjuring films – The Conjuring (2013) and The Conjuring 2 (2016). Mindful of the way that they had been able to spin an ancillary series off from the first film with Annabelle (2014) and its prequel Annabelle: Creation (2017), reshoots were conducted to add several scenes to The Conjuring 2 where Vera Farmiga’s Lorraine has visions of The Nun with the specific intent of creating another spinoff. Both Vera Farmiga and Patrick Wilson make small appearances at the beginning and start of this film, while the lecture hall scenes at the end feature an unspeaking appearance from Lili Taylor, the mother in the first film. I had a major problem with James Wan and company’s efforts to spin The Conjuring out into a franchise. The most glaring thing is that everybody seems to have forgotten that both of The Conjuring films were claiming to be true stories – The Nun makes the same claim in its opening scenes. It stretches your suspension of disbelief when a film based on facts then creates further entirely fictional adventures set around other characters in the story to market itself as a franchise. The film never comes out and says but leads us to believe that the character of Sister Irene later becomes Lorraine Warren – Taissa Farmiga (the younger sister of Vera Farmiga who plays Lorraine in the other films) is dressed in one of Lorraine’s outfits at the end. Not to mention that if Lorrain is having the flashbacks in The Conjuring 2 it logically leads to the conclusion that it must be her here. There is a small problem with this. It is a matter of biographic record that Lorraine Warren was born in Bridgeport, Connecticut on January 31st of 1927 and that she grew up in the area, attending Lauralton Hall, a Catholic girl’s school less than ten miles from her home, before meeting Ed Warren while she was working in a local movie theatre. However, The Nun seems to prefer fiction to true-life and gives us Lorraine as a novitiate nun (something the real-life Lorraine never was) about to take her vows at a convent in England. By 1952, the date the film has the young Lorraine at the convent, the real-life Lorraine had been married to Ed for nine years and they had just set up The New England Society of Psychic Research where they began to promote themselves as ghost hunters. The most irritating part of The Nun’s entirely bogus claims to be based on a true story is its setting – that of an abbey in Romania in 1952. Now there is no problem with that in itself – Catholic abbeys did exist in Romania in 1952. However, the opening scenes have Demian Bichir being dispatched by The Vatican to investigate the death of a nun at the abbey. The small problem with this is that Romania had been under Communist rule since 1948 where an order was made to shut all outlets of The Church down during which priests were imprisoned or expelled from the country. If Father Burke were sent to investigate by the Catholic Church there should have been a lot more made of his difficulty in obtaining a visa to enter the country and/or harassment from the Communist authorities. Furthermore, the predominant church in Romania is The Romanian Orthodox Church, which was formed out of the split between Eastern and Western Catholicism in the 12th Century – they were tolerated by the Communists so you have to ask why they would not be the ones investigating. I ended up hating The Nun. James Wan is one of the finest horror directors of the 2010s. However, when he has dipped his toes into producing other films – see the likes of Annabelle (2014), Demonic (2015) and Lights Out (2016) – he seems to have had difficulty in imparting his skills to the directors on these other films, which have been notedly lacklustre. The Nun comes from Corin Hardy, a former music video director who had previously made the horror film The Hallow (2015). Hardy’s hilariously adulatory biography at the IMDB tells how he made horror short films since the age of twelve and The Nun feels exactly like some eager fanboy has been granted a camera and budget and enthusiastically attempted to leap in with every trick he could think of. Given the helm of a major studio release, Hardy reminds of Mick Garris, the director of Sleepwalkers (1992), The Stand (1994) and sundry Stephen King adaptations, who is so in love with the jumpshock and relentlessly jabbing the audience in the ribs every few minutes that he keeps on repeating it ad nauseum. 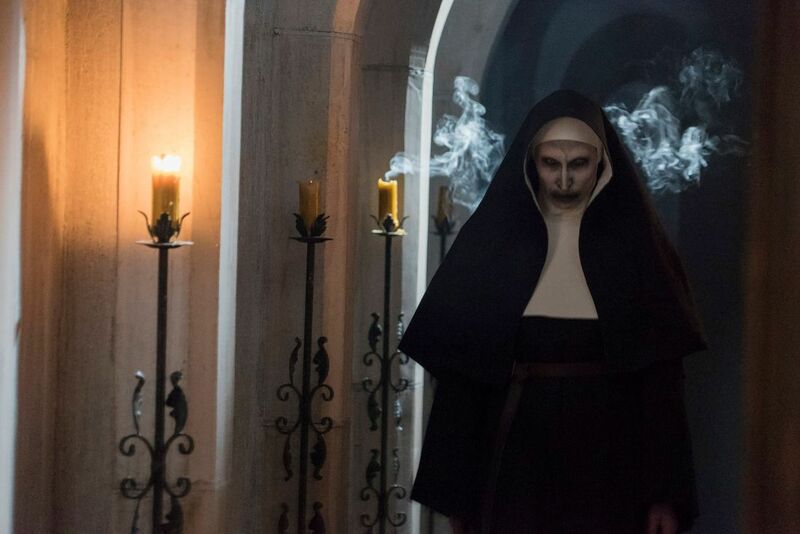 The Nun feels like a film that has no rationale beyond a Halloween haunted house attraction – that of making the audience jump out of their seats every few minutes. There is certainly almost nothing to the film that resembles a plot. Hardy’s scares become tedious – crucifixes turning upside down, nuns jumping out at people, shadows of nuns moving around the room independent of their owner and so on. In one scene, Demian Bichir is shoved into a coffin and buried alive by ghosts before Taissa Farmiga has to dig him out, hammering a shovel through the coffin lid inches away from his face – a scene blatantly borrowed from Lucio Fulci’s City of the Living Dead (1980). All of these are thrown at us in 3D, which further waters down their effect. What Corin Hardy fails to realise with his constant profusion of scares is that such persistent repetition kills any effect – after a certain period, audiences just switch off and let it wash over them. All that we are left with is a series of tepid, affectless scares in search of a plot. 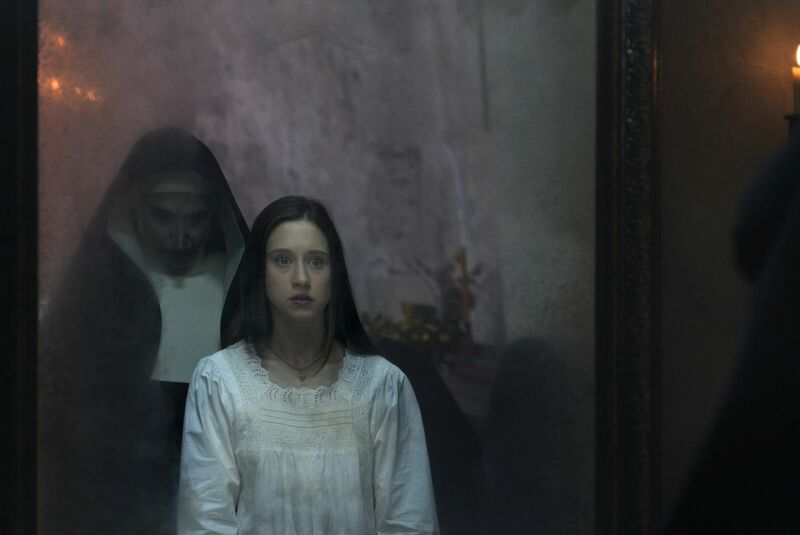 The Nun should not be confused with the earlier Jaume Balaguero-written The Nun (2005), which was also about a ghostly nun haunting a convent.